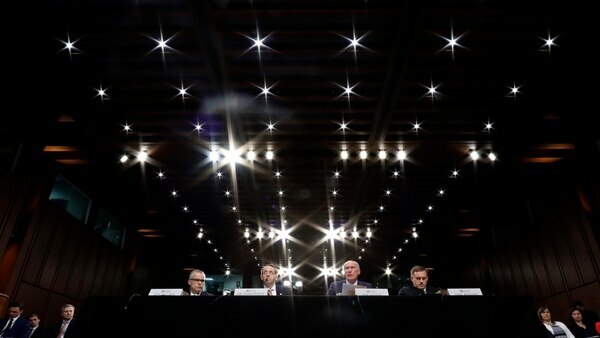 WASHINGTON — Lawmakers verbally sparred with top intelligence chiefs on Wednesday after they staunchly refused to answer questions about conversations they had with President Donald Trump regarding probes into Russian activities during the election. Members of the Senate intelligence committee wanted to know about news reports claiming Trump had asked Director of National Intelligence Dan Coats and Adm. Mike Rogers, the director of the National Security Agency, to publicly state that there was no evidence of collusion between Moscow and the Trump campaign. Trump has consistently pushed back against suggestions that his campaign coordinated with Russia and says the investigations into the matter are a hoax. 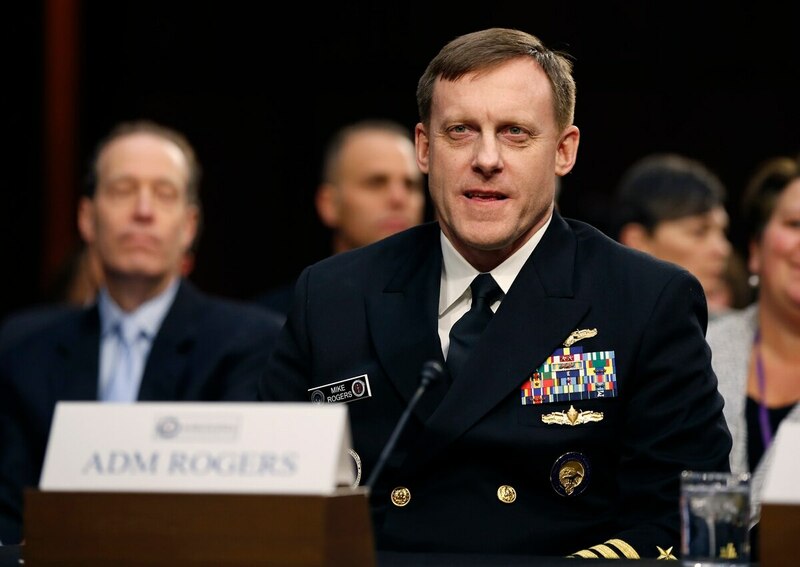 "In the three-plus years that I have been the director of the National Security Agency, to the best of my recollection, I have never been directed to do anything I believe to be illegal, immoral, unethical or inappropriate," Rogers told the committee. "And to the best of my recollection, during that same period of service, I do not recall ever feeling pressured to do so." Coats, who was confirmed as Trump's national intelligence director in mid-March, said: "In interacting with the president of the United States or anybody in his administration, I have never been pressured. "I've never felt pressure to intervene or interfere in any way and shape — with shaping intelligence in a political way, or in relationship to an ongoing investigation." 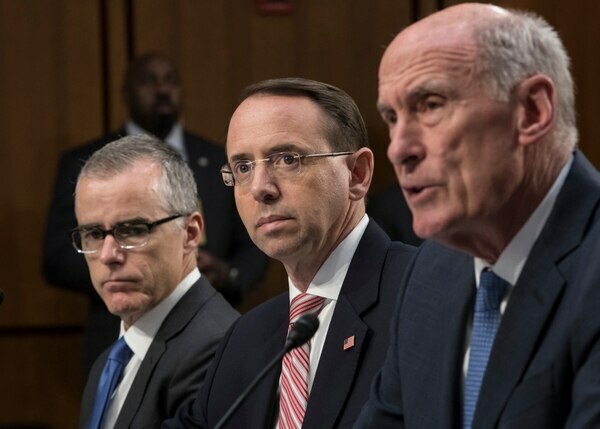 From left, acting FBI Director Andrew McCabe, Deputy Attorney General Rod Rosenstein, and Director of National Intelligence Dan Coats, testify before a Senate Intelligence Committee hearing about the Foreign Intelligence Surveillance Act, on Capitol Hill, Wednesday, June 7, 2017, in Washington. Those answers didn't satisfy the senators. Even mild-spoken Sen. Angus King, I-Maine, got testy. He demanded to know what legal basis justified Coats' refusal to answer questions. "I'm not sure I have a legal basis, but I am more than willing to sit before this committee ... in a closed session and answer your questions," Coats said. With the frustrated lawmakers gearing up for Thursday's long-awaited testimony from ousted FBI Director James Comey, the committee on Wednesday afternoon took the unusual step of releasing the written statement Comey plans to deliver. In it, Comey details a series of interactions with Trump that made him uneasy and appear to show the president disregarding the FBI's traditional independence from the White House. Comey said he was taken aback by specific requests, including one during a private Oval Office meeting in February where he said Trump asked him to end a probe into former National Security Adviser Michael Flynn. Trump complained that the probe had created a "cloud" over his presidency. During Wednesday's hearing, which was about the reauthorization of a federal foreign intelligence collection law, Democrats and Republicans pressed Coats, Rogers and also acting FBI Director Andrew McCabe and Deputy Attorney General Rod Rosenstein. The senators said they were puzzled as to why McCabe would not answer questions about conversations he had with Comey regarding the former FBI director's meetings with the president. McCabe said it would be inappropriate to discuss issues that might end up being part of the special counsel's investigation into Russian activities during the election. "I have to be particularly careful about not stepping into the special counsel's lane," McCabe said. From left, Acting FBI Director Andrew McCabe, Deputy Attorney General Rod Rosenstein, National Intelligence Director Dan Coats, and National Security Agency Director Adm. Michael Rogers are seated during a Senate Intelligence Committee hearing about the Foreign Intelligence Surveillance Act, on Capitol Hill, Wednesday, June 7, 2017, in Washington. At the close of the hearing, the Republican committee chairman, Sen. Richard Burr of North Carolina, said that executive branch officials have the option of briefing the committee or congressional leaders in a classified setting. "At no time should you be in a position where you come to Congress with no answer," Burr told the witnesses. "The requirements of our oversight responsibilities and your agencies deserve it." After the hearing, Sen. Mark Warner of Virginia, the ranking Democrat on the committee, lamented that the witnesses could have laid to rest questions about what the president told them about the Russia probe, but they chose not to answer. To refuse to answer the questions in a public hearing "just won't be enough," Warner said. "The American public deserves to know what the president of the United States did and what he asked of the leaders of our intelligence community." White House spokeswoman Sarah Huckabee Sanders said it's standard practice for executive branch officials, such as the ones who testified, to decline to discuss conversations with the president. She said the White House had not yet received any follow-up requests regarding the testimony of Coats or Rogers. "If it receives one, it will do its best to work with the committee to accommodate the request to the fullest extent possible consistent with these interests," she said.